It was a perfect start to our scrapbooking year that we were able to celebrate our friend, Jan’s birthday with her on Wednesday. Jan was celebrating one of those quieter birthdays with a 1 on the end….the birthday that comes after the big exciting one with the 0 on the end! I’m not going to give away your age Jan I promise but I do have to say that Jan is one of the better behaved scrappers in the Wednesday morning class. She is quieter than some of us and gets down to her work quickly which is just as well as Jan is the only one of us who regularly loves to masterfully make one piece of scrapbooking paper out of 3 or more pieces of paper. We all love this of course as we get to tease Jan about this and more importantly we get to see more of her beautiful collection of paper as she works. Jan always pours herself into her scrapbook layouts and like her they are calmly colourful, neat, intricate and precisely balanced in their completion. If you look carefully at this collage of Jan’s gifts from the Wednesday girls you will see that they all were related to her passion for her garden. How amazing that every gift was so appropriate for her and I promise we were not in cahoots when it came to choosing these gifts. After deliberating on what cake to make Jan I decided on this one which is her special place in her garden. 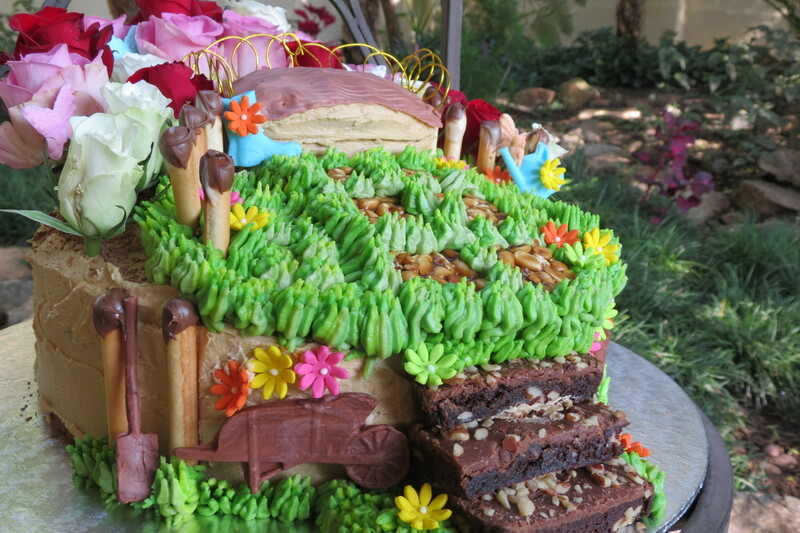 Everything on this cake is edible except for the metal twirls of the back of the garden bench. The stepping stones leading up to the bench are peanut brittle (these were bought from Woolworths and they were already cut into perfect squares and were rich and shiny looking ideal for the stones. The steps leading up to the garden are Woolworths chocolate brownies, once again perfectly sized in the packet and even sprinkled with nuts which gives the look and texture of garden steps. How can we not love our ‘Woolies’ for all these gorgeous goodies including the ‘wooden’ posts which are little snack treats with chocolate dipping meant for lunch boxes? 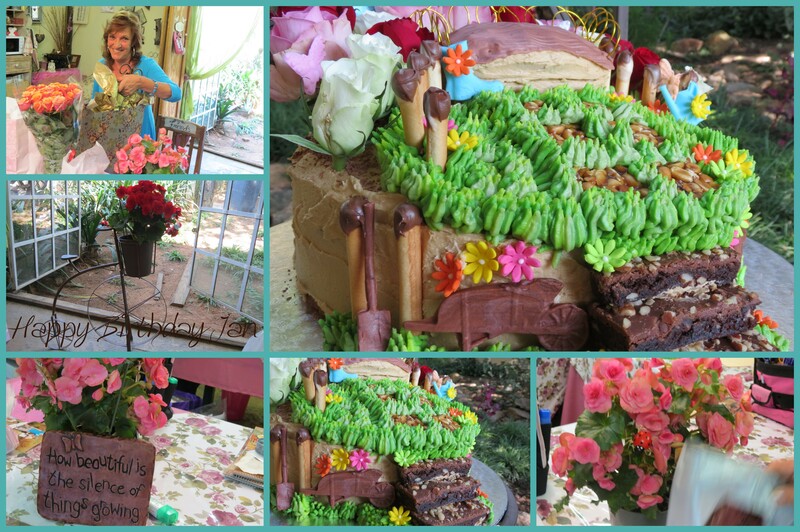 The sugarpaste molded wheelbarrow, spade, wellingtons and watering-can I made using a new mold I purchased from Chefs and Ices in Sandton City and although they are 2-D designs they are still effective on the cake. 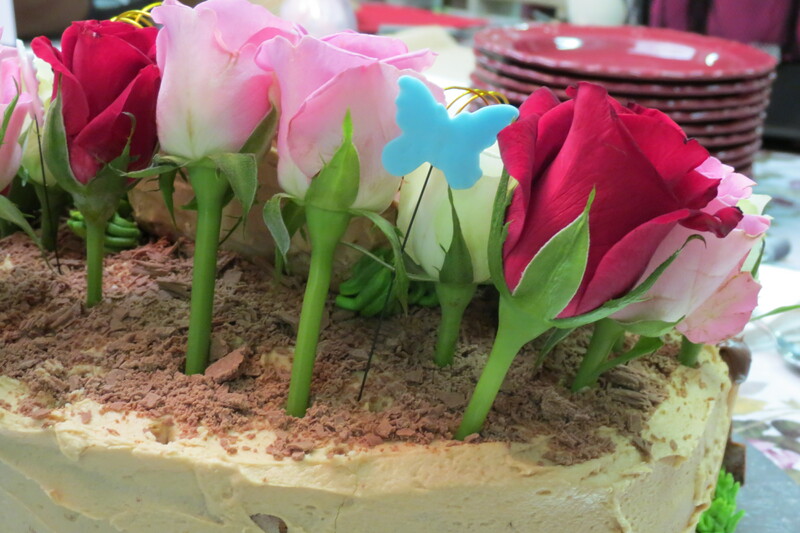 The cake is a coffee cake with coffee, cream cheese icing which I sprinkled with Flake for the look of earth on the cake. I mixed 3 different batches of green icing in my piping bag for the grass and then added fresh roses for the rose garden behind the bench. We loved celebrating your birthday with you Jan and we love all the laughs, stories and memories you have shared with us all. Here’s to many more magical Wednesday scrapping memories! The cake, as always, looks amazing! Sorry I missed tasting some of it! We missed you too Shaunagh but I am sure you will be told about all the shenanigans we all got up to. Get ready to taste Valentine’s Cupcakes this Wednesday!